Bears are large, hostile enemies that will attack if you are found infringing on their territory. They live either in the wilderness or in their cave lairs. 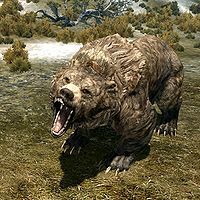 Bears carry the disease Bone Break Fever, which deducts 25 points from your stamina if you contract it while fighting one. Fortunately, bears will always roar or growl in an effort to intimidate potential threats before attacking, and thus are fairly easy to avoid if you wish so. 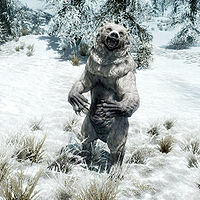 Standard bears and the larger cave bears are encountered throughout Skyrim and SolstheimDB, while the mighty snow bears are largely confined to high altitudes and snowy regions. 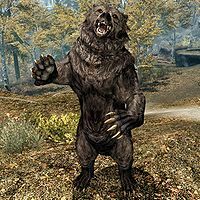 Bear carcasses can be harvested for their pelts (for tanning) and their claws (for alchemy). Regular bears were likely intended to be brown-colored and cave bears black-colored. This issue has been addressed by version 2.0.0 of the Unofficial Skyrim Patch; the mismatch is corrected. Although Cave Bears are supposed to be of the Cave Bear race (RefID: 000131e8), they are instead of the regular Bear race (RefID: 000131e7). Because of this, instead of doing 35 or 52.5 damage per attack, they only do 30 or 45 damage per attack.